Three year-old No. Three loves motion. My walks with her through the neighborhood and around town are always spiked with Three’s discovery of new objects and her new uses for them. Three was the first to discover that bicycle racks in our town aren’t actually for bicycles, they’re one bar monkey bars, also known as monkey bar. 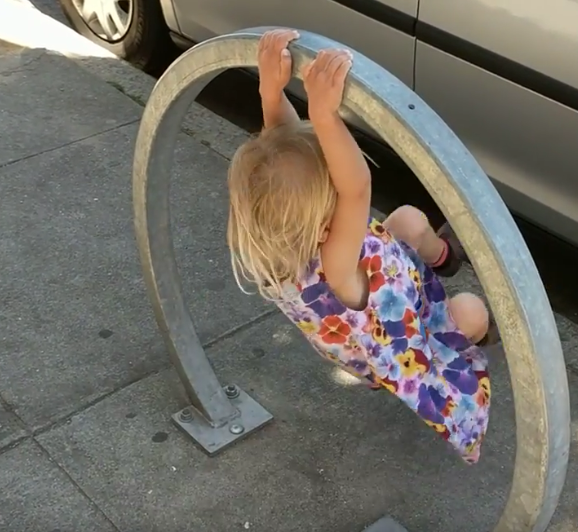 When she was two, she noticed one day that she could see through to the other side of a bike rack. Five seconds later, she was holding onto it with two hands, swinging back and forth with her feet lifted off the ground. One of our fancier neighborhoods who seemed to have figured out this trick, robbed the world of the joy by placing decorative metal work across the opening. The first time Three found one of these, I realized that two year-olds are capable of looks of the purest, un-mollified disdain. It should have been no surprise to me when a few weeks later, Three went from a vertical swing to a horizontal one. Arriving at the playground one afternoon, I found Three perched on a piece of equipment made for spinning. We call them—perhaps unoriginally—spinners. Typically kids stand on it, push themselves off a little bit, pull the leg they pushed with up, and spin for a bit. It’s a merry-go-round for one. As I walked over to the bench where my partner was seated, she said, “Watch this,” and nodded at Three. Three took hold of the handle on top of the spinner with both feet squarely on the ground, not on the little circular platform most kids stand on to enjoy the spin. “That’s odd,” I thought. Then, she started running in circles as fast as she could with the handle still in her hand. She was spinning up the platform. As she hit critical speed, she jumped up, and threw both feet away from the center of the spinner. With the resulting centripetal force, her body swung out making a horizontal line—from head to toe—parallel with the pavement below. She was virtually flying. At one point, she brought her other hand down to the standing platform making a sideways T with her arms and body. Her exploration of motion is an innate quality of Three’s. She has no fear, and surrenders her body to whatever she’s decided to try next. Thanks to San Francisco’s primo weather, and her free unschooling schedule, she’s outside almost all the time. New opportunities abound at every step! Just a little note to concerned ‘grownups’ everywhere. If you look at a kid—and I mean really look—I don’t mean notice a person shorter than you, I mean make eye contact, notice their facial expression and observe their body language—If you look at a kid, don’t assume they need your help unless they’re obviously distressed, or ask for it. You might think this is difficult call to make. You might think, not having kids of your own, that you’re unable to make this determination. You are. You do in fact, already have the skills even if you’ve never been around kids It’s a remarkably simple call to make, just use the exact same criteria you would for determining if an adult was in distress. Because, guess what, kids and adults are in fact the same species of animal and communicate in the same way. Honest. If someone—adult or child—doesn’t need your help, feel free to say hello, give a wave, give a smile, but don’t—do not—try to force help on anyone that doesn’t want or need it.